Katie McClanahan is a Senior Marketing Associate at Balentine. In this role, she supports Balentine’s online presence, branding, media coordination, and event planning. Prior to joining Balentine, Katie worked with education nonprofits for seven years, beginning with a stint as a 2009 Teach For America corps member (teacher). 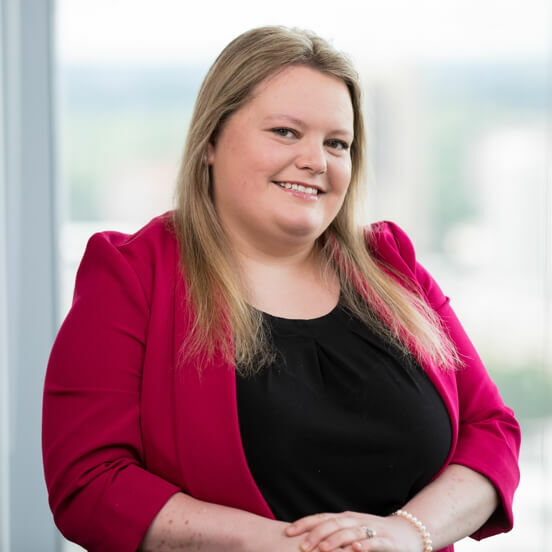 Upon completion of her two years of service, Katie relocated to Atlanta where she served as a member of Teach For America – Metro Atlanta’s Development team in the roles of development coordinator and individual giving associate. Most recently, Katie was the regional marketing and communications manager for KIPP Metro Atlanta Schools. Katie graduated with highest honors and highest distinction from the University of North Carolina at Chapel Hill, where she double majored in political science and journalism with a concentration in public relations. I’d been thinking for a while about transitioning to the corporate world, and culture was very important to me. I was instantly drawn to Balentine because of its values, emphasis on client service, and great sense of team. One of the Marketing Team’s goals is to make our materials accessible to all clients, regardless of their level of familiarity with wealth management. Given that I don’t come from a finance background, and thus am not as familiar with the technical jargon, I’m constantly checking to ensure that our communication with clients is as concise and understandable as possible. As a proud alumna, I’m a huge fan of all University of North Carolina sports, particularly football and men’s basketball. Go Heels! I previously considered careers in education policy or school operations, but marketing and communications is my passion. Reading is one of my favorite pastimes—I try to read at least 50 books a year—so it isn’t easy to narrow down to just three. My favorites are the classics, though, so I would want to bring The Great Gatsby by F. Scott Fitzgerald, Jane Eyre by Charlotte Bronte, and Great Expectations by Charles Dickens.